With Halloween just a few days away, we thought it would be fitting to look at some of the spooky stories from Manitoulin’s past. Death, drama, and mystery galore. 80 years ago, the Dodge family made quite the mark on Manitoulin Island - yes, that Dodge family. 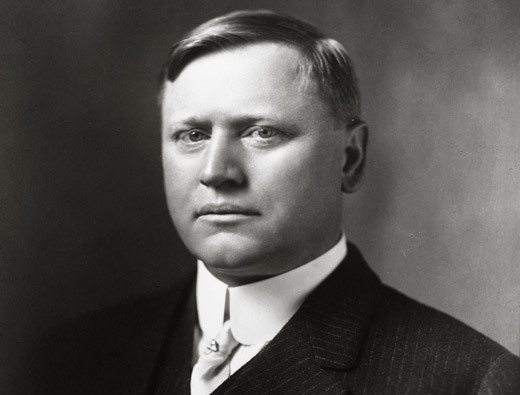 In 1914, John and Horace Dodge founded the automotive manufacturer formally known as the Dodge Brothers Company. John and Horace both died during the Influenza outbreak in 1920, and the family sold the company for $146 million just five years later. The money was split up among the children and families that were left behind. One of the lucky recipients of this great fortune was John’s son, Daniel “Danny” Dodge, who was only 3 years old at the time of his father’s death. He grew up to be an avid seeker of excitement, spending lots of time outdoors. He owned a private cottage on Manitoulin island - in Kagawong, actually, at Maple Point. It has been described as a woodsy ranch-style lodge, complete with a tennis court, speedboat, and his treasured red convertible. Like most good stories go, Danny fell in love. He was a 19-year-old kid living on the beautiful Manitoulin island, having the time of his life - those who remember seeing Danny back in 1936 recount him zipping around on his speedboat, hanging out on the docks with the island kids, and showing off his shiny convertible. He met a girl named Lorraine Mcdonald, a local girl from Gore Bay. She was a telephone operator. The pair married two years later, on August 2, 1938. Unbeknownst to them, they would only get to enjoy their marriage for two short weeks - before a horrible tragedy would swoop in and change their lives forever. On August 15th, Danny and a caretaker were in the garage, playing with some old dynamite they stumbled across. They were having fun lighting the sticks and throwing them out the garage door, watching them explode - seemingly unbothered by their close proximity. The loud and suspicious noise brought his new wife, Lorraine, and the other caretakers out to the garage to see what was happening. That is when everything went wrong. Danny had already lit the stick of dynamite, and attempted to throw it out the window instead of the garage door, where the others were standing. The stick didn’t make it out the window. Ricocheting off the window frame, it flew back into the garage and subsequently exploded. Shrapnel flew everywhere, their bodies badly burned and bleeding. Danny, Lorraine and the two caretakers were all badly injured. They decided to take Danny’s 250-horsepower boat to the Little Current hospital, just 40 minutes away. Despite her injuries, Lorraine drove. The waters were rough and unforgiving. Even after two hours of fighting against the strong winds and angry waves smacking against the boat, they were making minimal progress. The group was about halfway to Little Current when a sharp wave suddenly sent Danny flying over the edge of the boat. His body quickly sank beneath the cold, choppy water. Attempts at rescuing Danny were futile. Hysterical, exhausted, and in great pain, Lorraine and the others finally continued their venture to Little Current to seek help. The search for Daniel Dodge’s body stretched on for weeks. Boats and planes scoured the lake to no avail. A small submarine was even commissioned by his family. People were not willing to give up hope. Over $50,000 was spent throughout the search. Finally, about three weeks later, two fishermen found his body. Doctors confirmed that his cause of death was accidental drowning, and that he actually would have survived his injuries had he not fallen into the water. The whole ordeal was shocking, disturbing, and perversely fascinating - everyone was talking about the horrific death of the incredibly rich, Detroit-born 21-year-old. Some fingers pointed at Lorraine; people accused her of throwing him overboard to get a hold of Danny’s fortune. But it didn’t matter; Lorraine received the astounding $1.25 million inheritance. She lived until 2003. Tales of Danny Dodge swirl around the island to this very day. People fiercely believe that his spirit still resides at his lodge. One woman insists that when she stayed at the lodge with friends one night, pictures flew off the walls and doors swung open - all by themselves. She thinks it was Danny, trying to have fun with them. We might never fully know what truly happened that fateful day on the boat. Was it indeed the rough waves that sent him crashing over? This is just one of the great mysteries the island harbours. Last year, American shipwreck hunters found the mostly-intact remains of a sunken ship determined to be the 136-year-old Jane Miller, a package and passenger steamship that was on its way to Manitoulin Island in 1881. 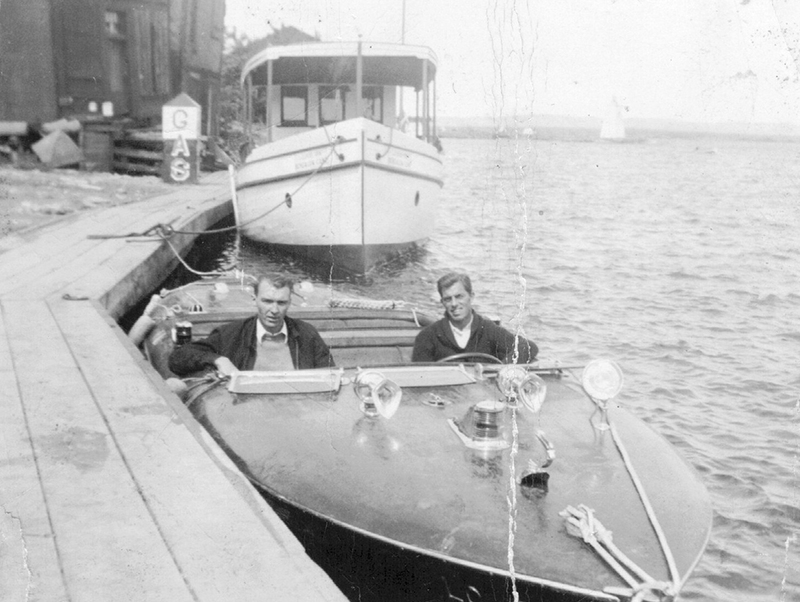 The ship was found in Colpoy’s Bay, just north of Owen Sound and east of the Bruce Peninsula. Shipwreck enthusiasts Jared Daniels, Jerry Eliason and Ken Merryman were the ones who found the wreckage. They explained how it was covered in zebra muscles, which made visually scouting the ship more difficult. 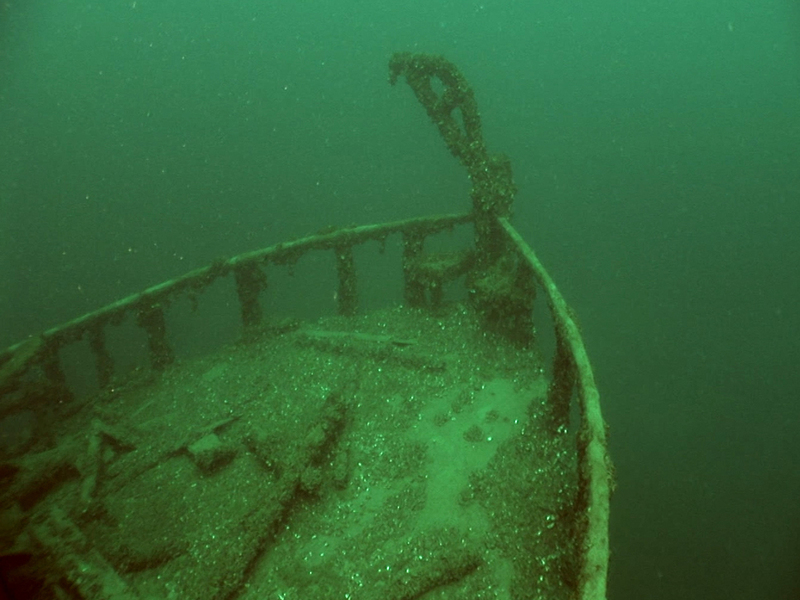 But it is very probable that the remains of bodies were among the wreckage, hidden in the depths of Lake Huron. Launched in 1879 (from Little Current, actually), the Jane Miller travelled between Collingwood and Manitoulin. In 1880, Captain Andrew Port bought the ship. However, with his previous boat, he had gotten lodged in ice a couple of times - stranded for weeks at a time, but always managing to get himself out of trouble. Some have argued that this demonstrates a pattern of recklessness and poor judgement. Either way, it’s safe to say that Captain Port had an extraordinary amount of confidence. Author Scott Cameron wrote a detailed story about the Jane Miller, stating that passengers aboard the ship were heading to Lion’s Head, Tobermory, Michael’s Bay, and even Little Current. Perhaps negligently, Captain Port appointed his 24 year-old son as the captain of this journey, and his 15-year-old son as the purser (an officer who deals with administration). Some would say this inexperienced leadership was a recipe for disaster. On November 25, 1881, the Jane Miller made her last trip towards Manitoulin. The ship was struggling to carry an unusually heavy load. The waves were rough; water cascaded into the boat. Snow fell from the skies, obscuring all visibility. After docking to try to fuel up, the Jane Miller was seen for the last time. 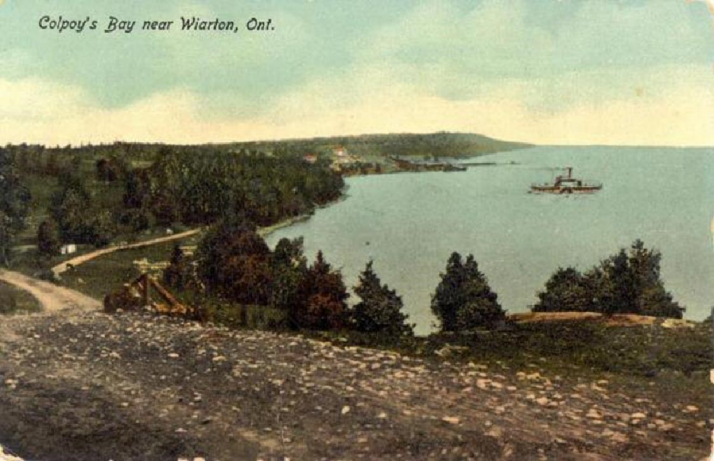 A man and his wife were waiting for another ship to arrive, standing on the shores of Wiarton. They briefly saw the lights of the ship in the distance, but it was a mere flicker before it vanished. 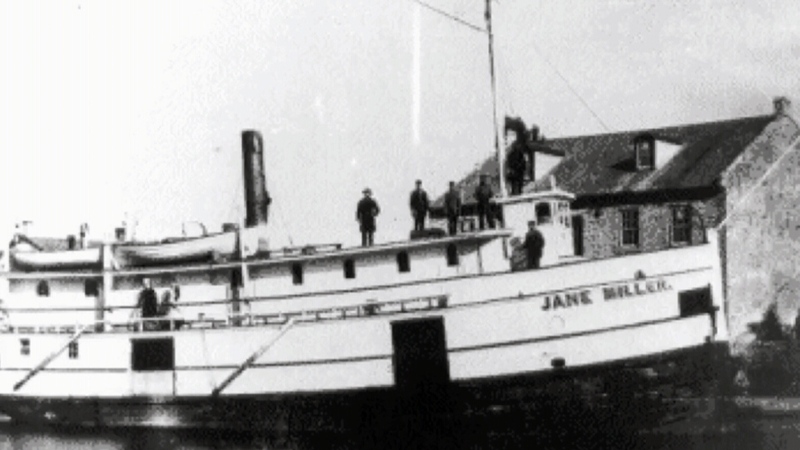 The next day, the waters were heavily searched for signs of the Jane Miller. She was nowhere to be found. However, many of the passenger’s possessions and ship equipment were found floating along the coast. Bubbles and strange discolouration were noted in the water near the Jane Miller’s last known location. Finally, two oars from the steamship were discovered - as well as the flagstaff and gangplank (the bridge that is used to board the ship). It was enough evidence to convince everyone that they would never see those 28 people again. The crew, cooks, watchman, engineers, the passengers and shantyman - all gone forever. Thanks to the discovery and photographs of the divers in 2017, we are able to further speculate about what happened. Scott Cameron explains that the gangway doors were likely left open after fuelling up, and paired with the vicious winds, the ship could easily have heeled and filled with water, dragging her down to the bottom of the lake. There are many questions about this shipwreck that are left unanswered. Was it due to Captain Port’s recklessness that the ship sank? Why did it take 136 years before the ship was discovered? Have any of those restless spirits found peace on Manitoulin Island, their attempted destination? These are questions we may never know the answer to. In May of 2016, a photographer from Mindemoya made a ghastly discovery in the forested area of Wagg’s Woods. A human skull toppled down a hill, landing right in front of him. Shocked and bewildered, he reported it. And thus began the investigation. Thanks to this strange and accidental discovery, fragments of another skull were found soon after - just meters away from the first, hidden under leaves. It was clear that the skulls had been exposed to the elements for a while, as they had been bleached by the sun, had moss growth on the surface, and were gnawed at by scavengers. However, the hilled area where the skulls were discovered was not their final resting place. They may have been dug up and carried there by animals. Both skulls were male, and originally estimated to be centuries old. The forensic facility that tested samples of the skulls determined that they were at least 800 years old. That revelation dates the skulls to way back before Europeans first arrived on the island. So evidently, both of the skulls belonged to First Nations men in the 12th or 13th century. Forensic specialists placed them somewhere between 20-60 years of age. It’s a large gap, but with the weathered condition and age of the skulls, it’s the most accurate conclusion that could be made. The nearby Indigenous community, M’Chigeeng, was informed of the skull discovery. A traditional ceremony was then held at the site. There were plans to give the skulls to the band, where a respectful burial would take place. But as of November 2017, the skulls had not been given to the First Nation community. The area was being investigated for further archeological findings, aiming to preserve the burial site. There are still many mysteries surrounding this spooky finding. We don’t know how the men died, exactly how old they were, and how the skulls even got uncovered. We hope you enjoyed these spooky mysteries! To read about these stories, click any of the links below.